All-inclusive used to be a bit of dirty word in travel. Usually code for “pack ‘em in, pile ‘em high” resorts where all-inclusive meant three buffet meals a day and watered down cocktails. But oh, how things have changed! In these days of belt tightening, many resorts that would have shunned the all-inclusive route have embraced it as a means of bringing value for money to luxury travel. For savvy honeymooners watching their budget, all-inclusives are a great option as you pay up front and don’t have worry about indulging when you’re there. Just make sure you look carefully at the resort itself and what exactly is included in the price. In the Maldives, all-inclusive makes a lot of sense because each island is home to just one hotel, so there are no other options to eat out. The four-star Ellaidhoo Maldives by Cinnamon is particularly good value, and has two casual barefoot bars and two restaurants, one with sunset views and a choice of buffet and a la carte. There is plenty to keep you busy including a dive centre, tennis courts and fitness centre. Find more all-inclusive honeymoons in the Maldives. On the Greek mainland, the sister resorts of Ikos Oceania and Ikos Olivia offer five-star all-inclusive honeymoons at competitive prices. The price includes a choice of a la carte restaurants, the option to dine out in selected local restaurants, an extensive wine list, free mini-bar, 24-hour room service and non-motorised water sports. Ikos Oceania is the smaller of the two, with a gorgeous private beach. Ikos Olivia, which opened in May 2015, is set in gardens leading to a white sand beach on the Gulf of Toroneos. Some rooms have a private pool and others have direct beach access. You can also get married there. A third resort, Ikos Dassia, will open on Corfu in May 2018. In the Caribbean, Sandals led the way in luxury all-inclusive honeymoons with everything from premium brand drinks to watersports and spa treatments and even a designer wedding in the price. I recommend their resorts in Barbados and Grenada. Also in Jamaica it has some stunning over-water villas, the only ones in the Caribbean. Sandals regularly has special offers with up to 60% off. Find more all-inclusive honeymoon resorts in the Caribbean. At Meeru Island Resort you have the option of going all-inclusive, and this resort is known for its four-star quality at three-star prices. It’s also worth looking out for complimentary room upgrades. There are two swimming pools, non-motorised watersports, a dive school, golf driving range, tennis courts, fitness centre and two spas, one of them over the water. There is a choice of two buffet and two à la carte restaurants and a range of bars. Find more all-inclusive honeymoons in the Indian Ocean. The Dominican Republic is one of the Caribbean’s best kept secrets – well at least for the UK market which has tended to regard it as a low quality package destination. 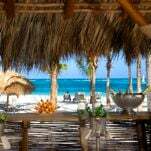 In fact it’s a vibrant Spanish island with boutique gems and top class all-inclusives like Secrets Royal Beach Punta Cana. Here honeymooners will find gold standards at silver prices – set on the palm-studded, sugar white beach in Playa Bavaro. There are gourmet dining options and premium brand drinks and watersports too – all included in the price. It’s great value for money. With Morne Brabant mountain to one side and the idyllic beaches of this southwest peninsula to the other, LUX* Le Morne certainly has location on its side. After a US$30m refurbishment, it’s one of Mauritius’ most sought after five-stars with its superb Nymphea Spa and gourmet Thai restaurant. Newlyweds are spoilt rotten. Since its refurb, the hotel has offered all-inclusive packages that make perfect sense for honeymooners on a budget. There are four swimming pools and free watersports including windsurfing, kayaking, snorkelling, waterskiing and glass-bottom boat trips. See more honeymoons in Mauritius. Most safari lodges are all-inclusive because they are by their nature remote. There’s no option to pop out to a local bar or restaurant. Most include all drinks in the price. Check out my detailed guide to the best safari honeymoons. On a budget? You can also search for honeymoons under £1,000 and under £2,000.